The shops lining M Street and Wisconsin Avenue have had a turbulent year. We’ve lost American Eagle, Commander Salamander, Up Against The Wall, FYE, Smith and Hawken, Nathan’s, etc. However, we have gained North Face, True Religion Jeans, Arisu, etc. A full survey from late January of the closings and openings can be found at Georgetownmetropolitan.com. 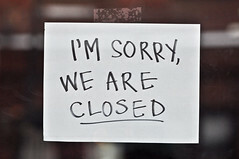 Now comes word from Georgetown blogger Carol Joynt that more stores are closed or in peril. According the Joynt, Benneton has already shuttered, Sisley is soon to follow and the Aldo’s “remodeling” is suspect. The rumor mill has also kicked up the much talked about Bloomingdales coming to the Georgetown Mall discussion. According to Joynt, the plan to bring the chain to Georgetown has not been scrapped, but is rather on the back burner. All in all, the retail and restaurant scene in Georgetown is in uber flux with the status of long time staples and new comers completely up in the air.